PicoFinance is a free stock quotes and news reader for any Java (J2ME, MIDP 2.0) or Symbian cellphone. With support for a configurable portfolio of stock quotes from most world exchanges, viewing breaking headlines for watched stocks, sharing articles and much more, PicoFinance is a complete, easy to use and free financial mobile application for mobile Java (J2ME, MIDP 2.0) and Symbian cellphones. The app “PicoFinance” (86 KB) is ready to download or send to your phone as filename:”PicoFinance”. 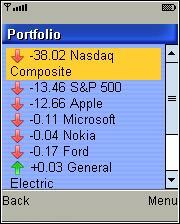 Download includes s&p &nasdaq averages.tried twice to get DJIA and all attempts erased my entire portfolio. Is there way to add or does the download include a bug? Sounds like a bug to me, have you reported it to the PicoFinance author? If that doesn’t work and you are able to copy files from a PC to the phone’s memory card and the phone has a file manager, download the JAR file and copy it to the phone’s card. Using the phone’s file manager, click of the jar file and choose Open. If none of the above works the phone probably doesn’t support user installabe Java apps.